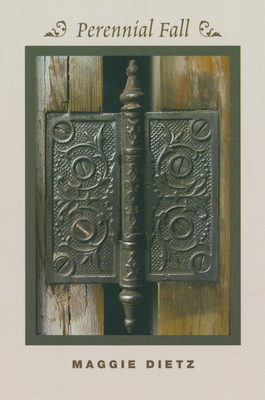 This is an interesting poem, all about hinges! The double spacing is the way it appears on the page in Perennial Fall by Maggie Dietz [811.6 DIE], and I suspect that spaces also act as hinges. 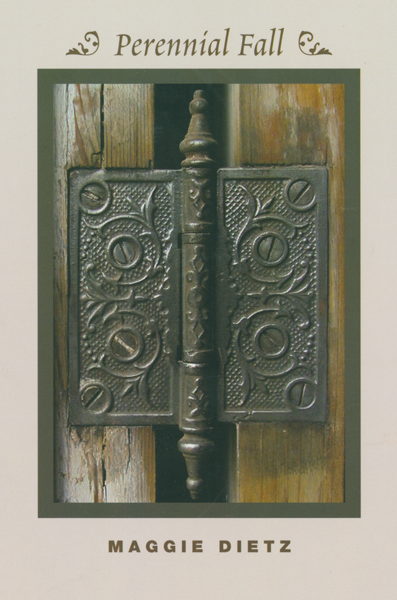 A book a hinge, the page a hinge. The mind, this way and that, a hinge. closes, opens, closes. The night. The clock. The thought. The heart. The door. The breath. Very rhythmic, don't you think? I find it to be quite an appealing little poem! The last Poetry Friday Round-Up for June is being hosted at Paper Tigers. 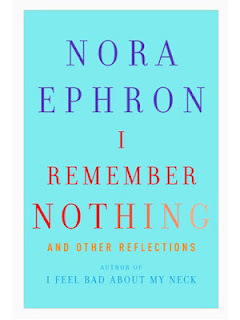 I read with much sadness of the death of Nora Ephron. Ms. Ephron was a multi-talented woman--a writer and a film director, and, if you're to believe the NY Times obituary, and a remembrance on NPR, a funny and gracious individual. 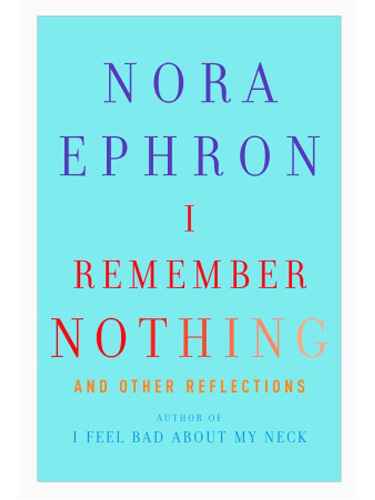 Finally, I'd like to direct you to an interview with Nora Ephron on NPR, which is notable for its candor. Click here. We have identified it as a Giant Leopard Moth (or Eyed Tiger Moth), and its scientific name is Hypercompe scribonia. Barbara discovered it on the bricks outside the front door. We moved it under a bush, but we're a bit doubtful about its survival after last week's heat. Eyewitness Handbooks: Butterflies and Moths by David Carter [595.78 CAR] contains information about 500+ butterflies and moths, so, I was sure I'd find the Library moth in that volume--and I did. 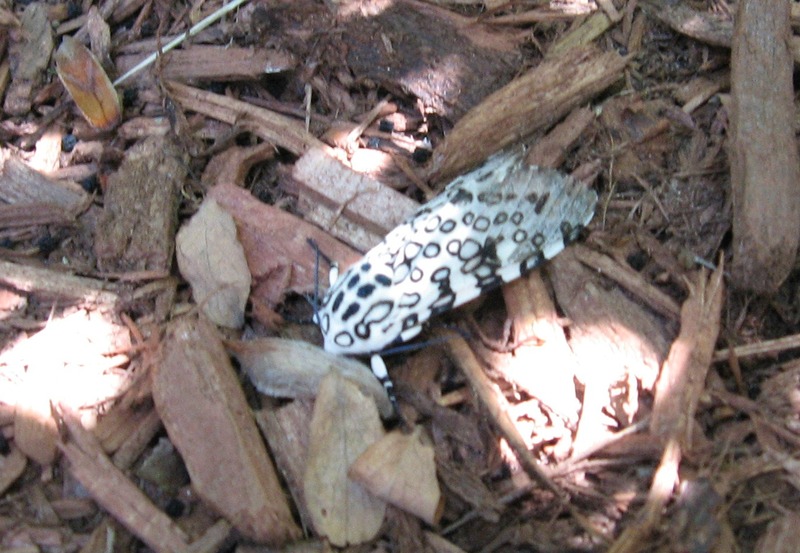 I also found an awesome website, Butterflies and Moths of North America, which has lots of information. To see some of the other creatures we've had at the library, click here and here. 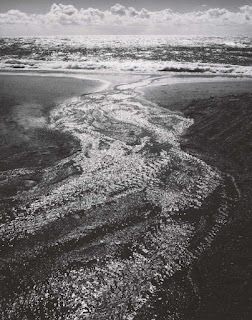 The Peabody Essex Museum in Salem, MA, is currently displaying a collection of photographs by Ansel Adams titled, "At the Water's Edge." The exhibit runs through October 8, so you'll have plenty of time to plan a trip to see it. 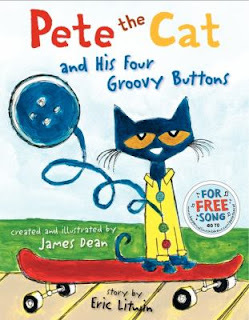 The library has a pass to the PEM and you may book the pass up to a month in advance. Click here to get started. If you plan to visit the exhibit with a child in tow, you may want to prepare him/her before going by reading a little about the photographer. 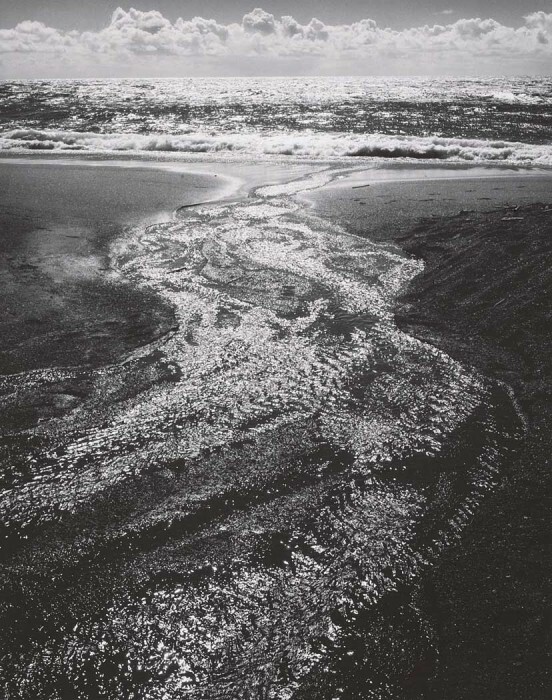 Eye on the Wild: A Story about Ansel Adams by Julie Dunlap [J B ADA]. Bring your camera along with you on your trip to Salem and take a few photos of the waterfront, then you can mount your own "At the Water's Edge" exhibit! Photo by Ansel Adams courtesy PEM. Last week the Boston Globe ran an online feature about New England's Best Ice Cream. As would be expected, it mostly celebrates ice cream places in proximity to Boston and Cambridge. A weekend or so ago, I visited one of the places mentioned, Shaw Farm in Dracut. I highly recommend it, and, if you have kids, there's the added bonus of seeing cows and a donkey! It may be a stretch, but you can make your own ice cream at home. 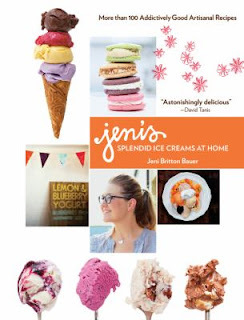 We have a number of books that can show you how including Jeni's Splendid Ice Creams at Home by Jeni Britton Bauer [641.862 BAU], which takes you from equipment through to finished product. More than 100 recipes are found within. 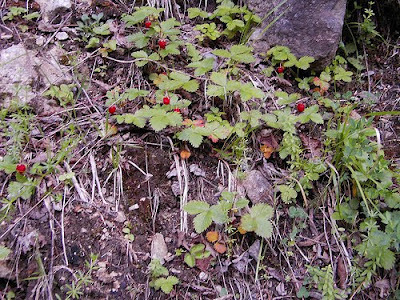 Today's the twenty-second of June, just one day later than the title of the summer poem I've picked for this first week of summer, "June Twenty-First," by Bruce Guernsey. on the patio under the chestnut. The next door neighbors are over. laughter jiggles in everyone's drinks. in the sprinkler's circle of water. too young to laugh with my father. I stand there with my hands in my pockets. bright as a penny in a loafer. Found in Pocket Poems, selected by Paul B. Janeczko [YA 811.5 POC]. If this doesn't spell "summer from the 1960s," I don't know what does! 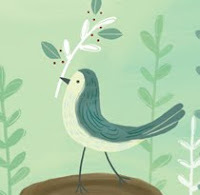 This week, Amy is hosting the Poetry Friday Round-Up at The Poem Farm; stop by for a visit. 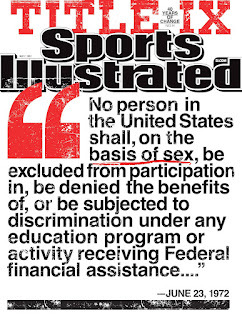 Of course, there are exceptions that are spelled out in the law (you can read the complete text here), but for most girls growing up over the past 40 years, it meant that they could actively participate in sports in school, and that girls' sports would not be pushed aside in favor of sports programs for boys. 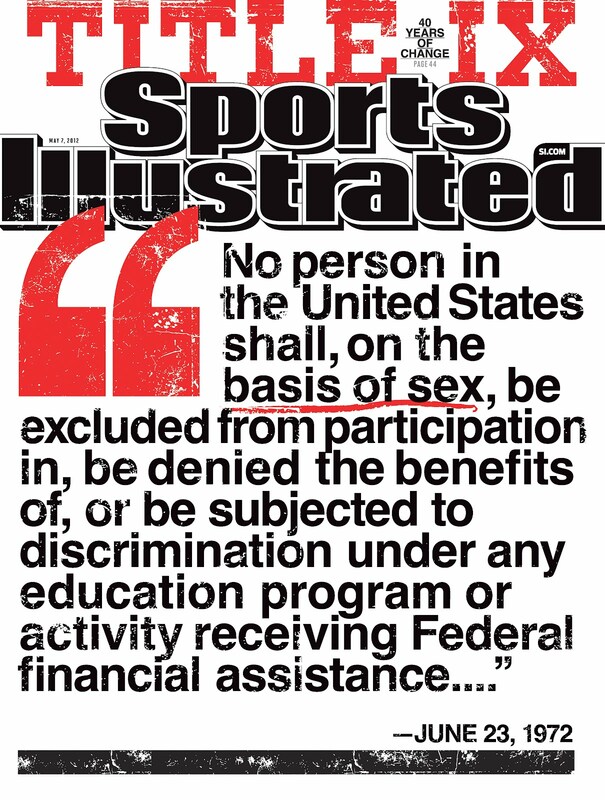 To learn more about women, sports, and Title IX, visit the Women's Sports Foundation website or check out this awesome book by Karen Blumenthal, Let Me Play: the Story of Title IX: the Law That Changed the Future of Girls in America [YA 796.082 BLU]. According to the Old Farmer's Almanac [R 031.02 OLD 2012], summer officially arrives at 7:09 PM. Tomorrow summer officially arrives at 1:00 PM, when we kick off our Summer Reading Program, "Dream Big--Read!" All the details are here. Next Wednesday, we will kick off our Teen Summer Reading Program, "Own the Night." Details here. 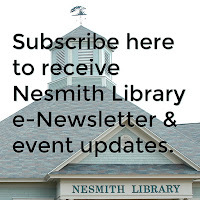 The Nesmith Library is definitely the place to be this summer! And, with the expected heat and humidity expected today, and for the next few days, the library building will be the cool, air-conditioned place for comfort! Kids and music. Just how often can I write about it? About once a week, I'll bet! Today I'm going to report on a recent Time magazine online article, "Want a Less Fussy, Easier-to-Soothe, Kinder Child? Make Music!" by Maia Szalavitz. The title just about says it all! But, still, it's worth reading the whole article! Three new studies suggest that teaching even the youngest children to make music with others can not only reduce distress and make infants smile and laugh more but also enhance brain development and boost empathy. Whether it’s drama or music, however, research is demonstrating just how valuable arts education is to children--unfortunately at a time when it is becoming less and less accessible due to financial pressures on parents and school budget cuts. Fortunately, getting down on the floor with your toddler and banging out some rhythms on pots and pans doesn’t take any money--and it might actually spare you more headaches than it creates. The idea that music is important to a child's development is not new. 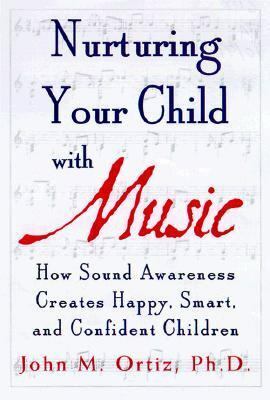 Nurturing Your Child with Music: How Sound Awareness Creates Happy, Smart, and Confident Children by John M. Ortiz [780 ORT] has been on our shelves for a dozen years! More recent books on the physiological and psychological aspects of music include This Is Your Brain on Music: The Science of a Human Obsession by Daniel J. Levitin [781.11 LEV] and Musicophilia: Tales of Music and the Brain by Oliver W. Sacks [781.11 SAC]. Music is something I will undoubtedly be talking about again! School ended on Friday and now thoughts turn to vacation! Perhaps you can't take a lot of time off this summer and would like to vacation closer to home. You're in luck! New England has an abundance of places to visit whether for adventures, or for learning, or for simply getting away. 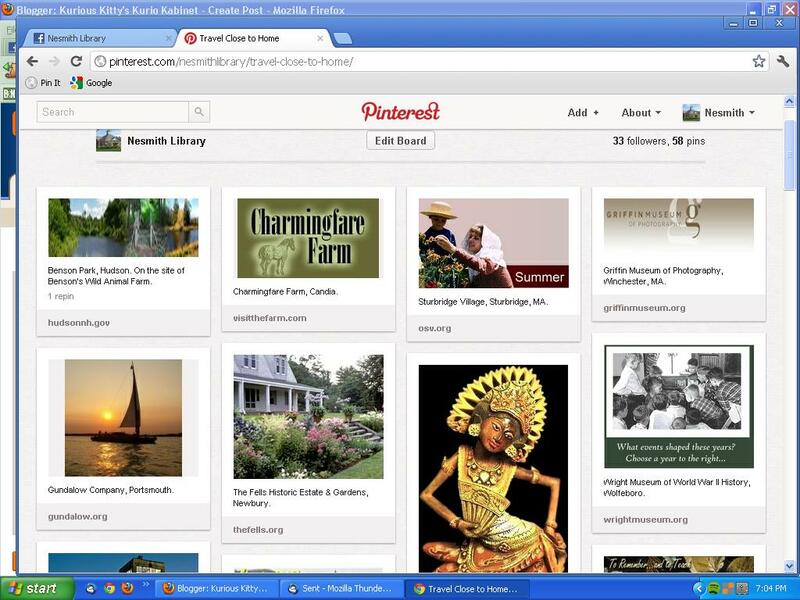 We've recently been pinning some of these New England places on one of our Pinterest boards. You can find the "Travel Close to Home" board here. It's still a work in progress, so feel free to make suggestions! We also have a nice collection books on New England in our travel section [917.4], as well additional ones, such as Naturally Curious: A Photographic Field Guide and Month-By-Month Journey through the Fields, Woods, and Marshes of New England by Mary Holland [508.74 HOL], which are found in other subject areas. Have fun and send us a postcard! 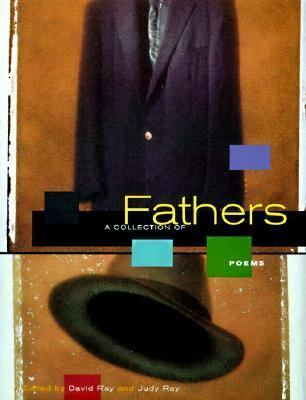 Poetry Friday--Don't Forget Father's Day! This coming Sunday is Father's Day, in case you've forgotten. Kids can make a card and moms can plan a trip for the family to the Rockin' Rib Fest. What dad doesn't like barbecue? I've been to at least four Rockin' Rib Fests and I can testify that they are AWESOME! Stop by A Year of Reading where I'm sure there will be other father poems to explore! In 1949, President Truman signed an Act of Congress designating June 14th of each year as National Flag Day. That's today! Here's a short video on the history of the American flag. It was produced in 1938, 20 years prior to the last two states being admitted to the union, and just prior to the start of World War II. If you're feeling patriotic now, how about a chorus of "You're a Grand Old Flag"? 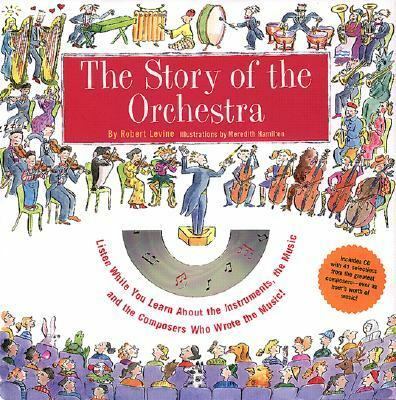 It can be found on the CD Stars and Stripes Forever, Volume II [CD MISCELLANEOUS STA]. First Lady, Michelle Obama, recently published a book called American Grown: The Story of the White House Kitchen Garden and Gardens Across America [on order]. It is part of the First Lady's campaign for healthy eating. The video below, "Garden's 'Teaching Moments'" is an illustration of the way growing a garden benefits more than just your family's health. It's not too late to start a small garden this summer, and if you're uncertain about your gardening skills, we have plenty of materials to help you through the processes of planting, growing, and harvesting. Just visit us and head for the 635 section. 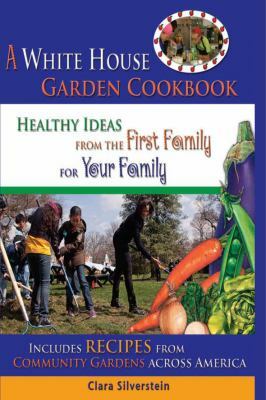 In the late summer, and early fall, look for another book about the White House garden, A White House Garden Cookbook: Healthy Ideas from the First Family for Your Family by Clara Silverstein [641.597 SIL] and cook up your bounty! There is an interesting online article, "Why Snow Is Cool," published in UNH Today from the University of New Hampshire, about graduate student Elizabeth Burakowski's study into reforestation and regional climate change. was established by the National Science Foundation in 1979 to strengthen science and engineering infrastructure in states that historically have received less in federal research grants....Since NH became an EPSCoR state in 2004, $93 million in federal grants have been awarded to build research capacity in New Hampshire. To learn more about NH EPSCoR, click here. Speaking of New Hampshire forests, now is a great time to get outdoors and visit our forests. We have many NH travel guides, including this one that is specific to forests: Nature Guide to the Northern Forest: Exploring the Ecology of the Forests of New York, New Hampshire, Vermont, and Maine by Peter J. Marchand [581.73 MAR]. Also visit the Northern Forest Center site by clicking here. Benson's Animal Farm has made a rebirth as a destination for walkers. On a sunny day, the old park, minus the animals, is full of people strolling the volunteer-restored grounds. There is also an emotionally moving 9/11 memorial at the entrance to the park, which is worth the trip even if you're not a walker. For a printable brochure and map, click here. Check our shelves for the photo-illustrated Remembering Benson's Wild Animal Farm, Hudson, New Hampshire by Bob Goldsack [974.2 GOL, we also have a copy in R 974.2 GOL] if you're interested in the history of Benson's up to the time it shut its doors in 1987. You can also visit and "like" Benson's Wild Animal Farm on Facebook. 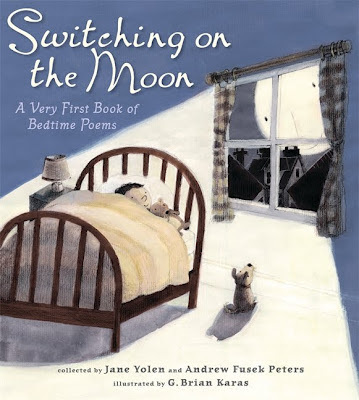 I don't know how I missed seeing Switching On the Moon: A Very First Book of Bedtime Poems, collected by Jane Yolen and Andrew Fusek Peters [J 811 SWI], but I recently made up for lost time. It's a lovely collection of poems, gently illustrated by G. Brian Karas. I'm not familiar with the multitude of illustration techniques, so I'm grateful for the information provided by the publisher, "The illustrations were done in gouache, acrylic, and pencil." British poet, Roger McGough, is represented with three poems, one of which I will share today. I recognize the name, Roger McGough, but I didn't know anything about him. A quick online search led me to the BBC Radio website where I discovered that McGough hosts a weekly poetry program, Poetry Please. I can't wait to explore the archives! For now, though, I'm going to head over to Jama's Alphabet Soup for the Poetry Friday Round-Up where I always find mouth-watering food suggestions to go along with whatever it is that Jama is posting about! The photos of red ripe tomatoes, which she posted on Wednesday, still have me drooling two days later! I'm sure I don't have to tell you that reading aloud to a child is one of the most important things you can do for him/her. Now, there is research proving that you can increase a child's chances of succeeding as a reader if you make some simple text-based changes in the the way you read. Want to learn more? Click here. Last weekend NPR ran a story about New York Philharmonic's Very Young Composers program. Composers and musicians work with New York City elementary school children to introduce them to musical composition. The guidelines we give the schools, in trying to identify some fourth- and fifth-graders for the program, is that they be kids for whom this could make a difference. Whether or not they study an instrument is not necessarily a good predictor of whether they're going to do something creative in music. The program appears to be a success, if success if measured by the fact that 10-year-old Milo Poniewozik recently made an appearance with the Philharmonic when they performed his composition, "The Globetrotter." Yesterday, June 4, was the date upon which the first minimum wage law was passed. 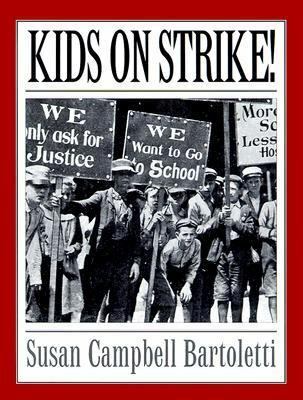 It happened in Massachusetts in 1912. Read the history here. It didn't cover all workers, only women and children. Sadly, the women and children of that time were taken advantage of by the owners of mills and other businesses. 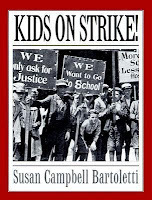 If you don't believe me, take a look at the captions of some of the photos taken by Lewis Hine, which are available online in the National Child Labor Committee Collection at the Library of Congress. A rare happening will occur tomorrow--the transit of Venus across the sun. Unfortunately this heavenly show is NOT something you should view directly. It is however, a rather interesting event, and you can learn more about it here. We have a number of books for children about the planet Venus in J 523.4. Before gearing up for strawberry shortcake, stop by Carol's Corner for the Poetry Friday Round-Up.